Trinidad’s dining scene continues to take healthier strides with more vegetarian restaurants and grab-and-go options at cafes, gourmet grocers and even the larger pharmacy chains. TEMPORARILY CLOSED – Namaste India Restaurant (Freeport, Trinidad) – Located in the Lakshmi Narayan Temple, this vegetarian restaurant features well-priced lunch (12-3pm) and dinner (6-10pm) buffets featuring north and south Indian cuisine including sweets. The average buffet price is TT $70-80 and is dine-in or take-out. Reservations recommended especially for dinner. (868) 673-5569, 288-7169, 288-7695, 371-7098 or 355-6814. 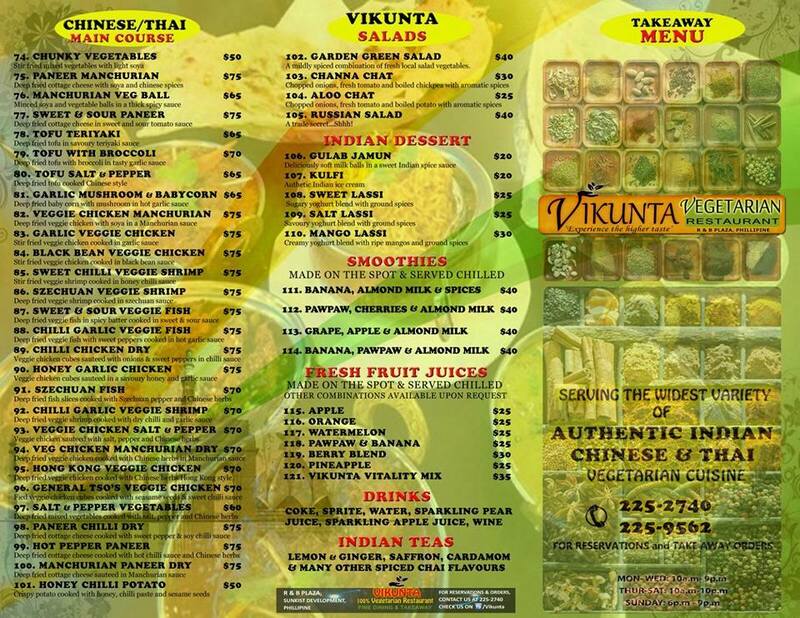 Vikunta Vegetarian Restaurant (Philippine, San Fernando, Trinidad) – “Authentic Indian, Thai, Chinese Cuisine.” Link to menu. (868) 470-5103 or 363-4469. Are there other vegetarian/vegan restaurants or great spots with a wide range of vegetarian options that should be added? Or have you tried any restaurants on this list? We would love to hear your feedback, let us know in the comment section below! Is this a health food restaurant or grocery store? Govinda’s Pure Vegetarian Cuisine – roadside hut outside the Hare Krishna temple in Edinburgh Road, Longdenville. Full lunches plus savouries like samosas, doubles and an amazing vegetarian version of bake and buljol. They do catering too. Opened just over a month ago. Thanks Shelly, we’ll add it to the list! Thank you Stacy, we’ve added Nanda Bhavan to the list!